Totally can't wait to get my hands on this. Good to see it is completed at last. Yay! On a side note, which conventions are the TMNT crew attending this summer? Also another side note. Does anyone know what 4Kids Con schedule is? If it wasn't too late to book a hotel anywhere near the place, I'd see about arranging press passes to the event.. I don't care if it's $10.00 I'm just happy things are finally moving forward in the land of TMNT things! Everything has felt so stagnant for so long. Will the book be available for free at wowio.com and ninjaturtles.com? Is the goal to still wrap Vol. 4 up in about 5 issues, when will issue #31 be available, and has work been done on issue #32? Don't recall if that logo was used on previous issues or not, but I think I dig it. Glad to see a new issue, too. Makes me wish that you still had the old subscription servies...I would have to have one again.. The logo from issue twenty-eight makes a valient return, huh? Was that a conscious desicion? I'm really looking foward to seeing how Volume 4 turns out. I've personally really enjoyed the plotline so far. But because it's inevitably going to come up, what on earth keeps these from coming out in a more timely manner? I know you have alot invested (creatively) in the series, and I mean this with no disrespect, but have you thought about having someone else do the actual script writing under your supervision? For time's sake? Awesome sauce!! It'll be on Wowio right? 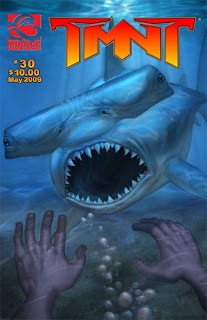 -->> .. that fuggin' LOGO looks so damm awesome above the shark !! Who the heck created this one ?! This time i am going to be one of the first persons to buy that comic cause i want it with the turtle head sketch! Oh good, and you brought back the new logo from two issues ago. Nice.